This mod removes the yellowish tone of High Elves and the brownish tone of Wood Elves, giving them a paler tone of skin. Elves are pale right? Except those dark elves. Not in TES though, here they made high elves yellow (because being high they are valuable like gold?) and woods elves brownish gray (because they are made of wood?) Of course, they are free to do what they want with their fantasy world, like converting dwarves into absent elves of another variety, and orcs into a playable civilized race instead of the traditional monsters of fantasy. However, we don't need to like it, and that's what mods are for. 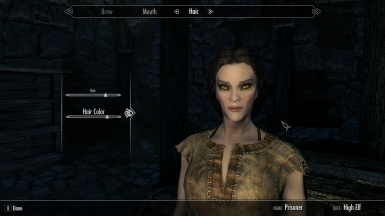 This mod makes High and Woods elves to have pale (pink) skin. It totally replaces the vanilla skins, so you can't go back to having jaundiced skin for your elves. There are other mods like More Elven Skin Tones by DataRomance, which do something similar, however they do so by adding pale skins to vanilla skins side by side (so you can still choose from both). This causes conflict with many mods that change faces, hair, presets etc for some reason. In Pale Elves I took a different approach that avoids these conflicts as far as I can tell. ***Skyrim Special Edition uses Fallout 4 assets. FO4 applies a brown filter to all skins, so even the palest character will look as if they spent some time in the sun. However, the yellowish and maroon tones of High/Wood elves are still removed. We can't get those real pale tones as in original Skyrim though. Sorry. ***This will only affect your player character. NPC's will still have normal skin tones. Compatible with Total Character Makeover. Probably with any other mod that directly modifies the High Elf or Woods Elf races in any way.